We finally urge the three of them to go sight-seeing and I eat something in the dining room. Casa Santo Domingo staff have been stellar throughout all this, letting us use their phones without a murmur and even helping us dial through. We have to send a letter of thanks to the manager letting him/her know what a classy staff they have there. 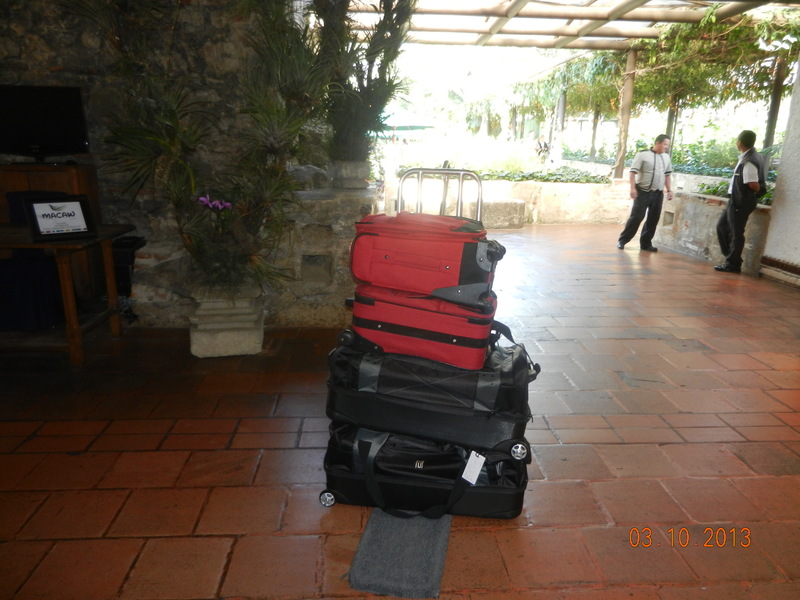 Meanwhile, our bags are patiently waiting for us. By all this time, Simba comes back and we are ready to get back to Guatemala city. It is a quiet ride back and we thank Simba for all his help and bid goodbye to all 3 of them at Hotel Barcelo. 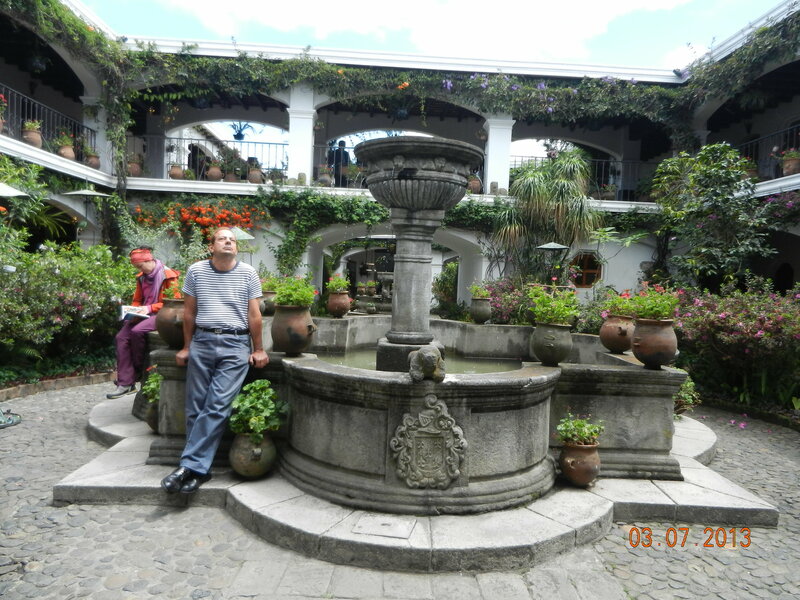 Then we get back to our hotel and send some emails and go to bed to get up really early for the next phase of our trip, onwards to Copan, Honduras with the new guide , Arty. 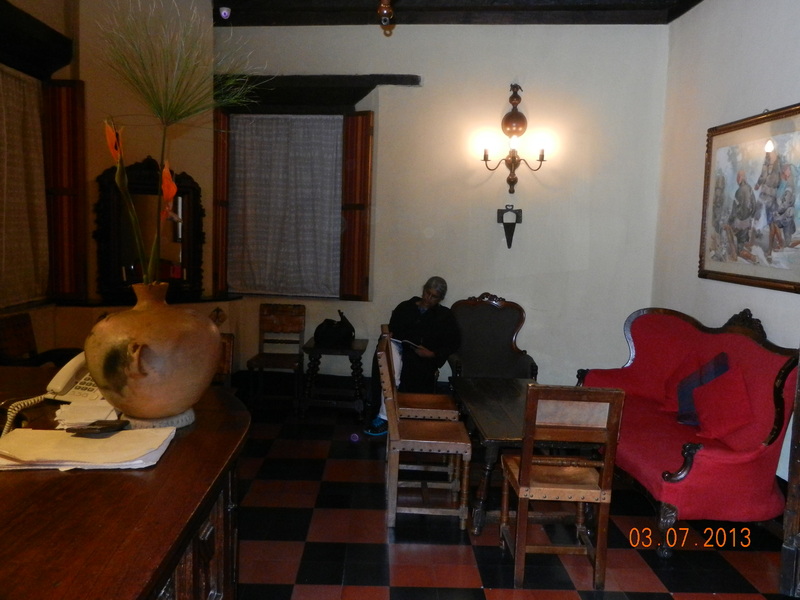 That night was so lovely eating in that dining room in Casa Santo Domingo. I think about it the next morning as we go in for breakfast. What a blast we had! Last night these mariachi guys sang to us moving from table to table and made me feel like giggling. The soup was heavenly and the waiters were dressed in purple while the hostess was dressed like a nun. The same attires invite us for breakfast and I wonder at the reminders around us of a Catholic country. I feel a little uneasy, not because I am non-Catholic but I would feel equally uneasy with a Hindu religious theme surrounding me in a hotel. Separation of church and hotel is important to me I guess. After all the hoopla for breakfast, we pack our bags and wait for Simba. He comes very late and that is the first strange thing that happens today. “Why so late?” we say together. ” Too much traffic today, they have a big procession in the main square, lots of crowds” he says wearily. Semanas santa, they start their parades long before Easter here. Simba is like the Nike ad; he just does it and does not say what is going to happen next. Now I wonder, maybe things would have been different that day if I had known we would be walking into crowds, the procession would take so long, etc, etc. But that is just me, Epimethius, worrying after the event. 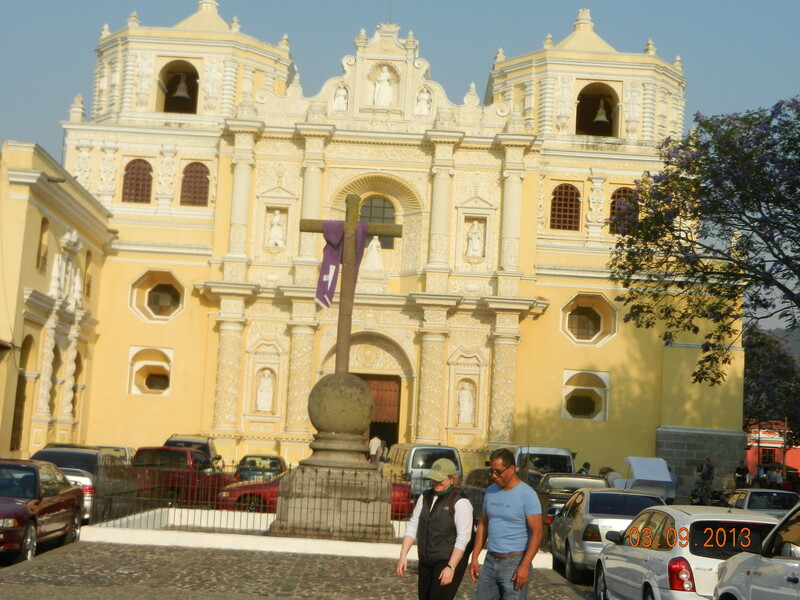 “Antigua used to be the capital of Guatemala, but then they had earthquakes and had to move to capital to Gautemala City,” Simba informs us, I can see this city being the jewel of the country with its colonial-style architecture and beautiful cobblestoned streets. We first walk down the cobblestoned road avoiding the cars and see a black statue holding a cross in a park. “That’s Bethancourt, he was one of the first to start helping the poor. I will show you the famous hospital he started further down.” We are admiring the streets, the buildings and then he shows us the fountain square. I am struck by the new gas station across from this ancient european-looking square. 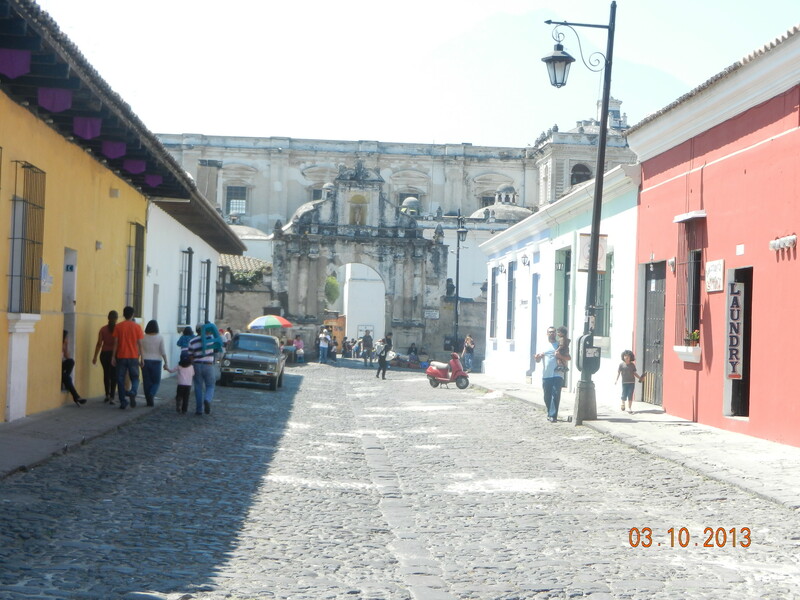 No wonder my brother loved Antigua, it is so charming…..the old ruins intermingling with the brightly colored houses, the cobblestones, the sunny weather, the festive atmosphere. Now we see more and more people and the vendors selling food.”Corvates, corvates!” they yell and I wonder why they are talking bow-ties and then I see them, honey-dipped deep fried batter that looks like bow-ties! 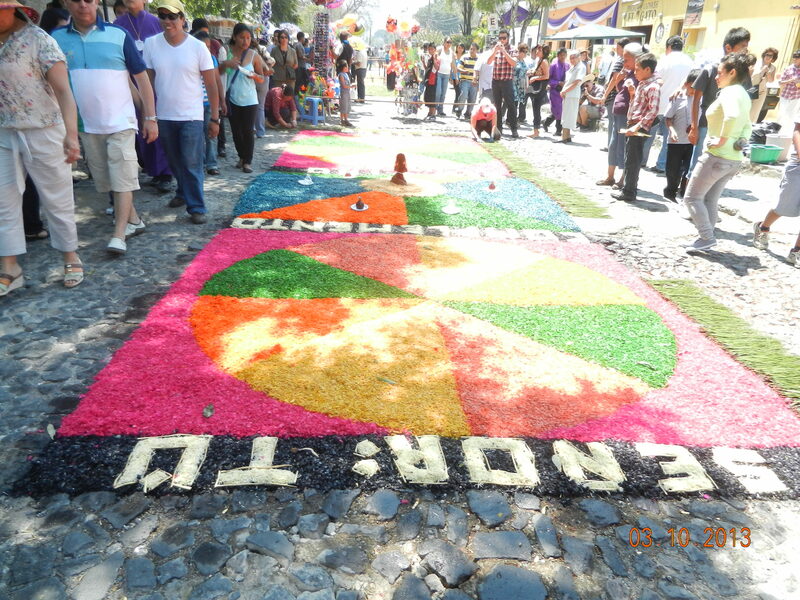 Ices, colored candy, little games for children and vendors yelling are all around us. Soon we see a procession far, far away moving slowly. Simba warns us to be careful with our purses and I am close to a barred wooden door, looking at the procession. We have finally stopped to watch after seeing rows and rows of beautifully decorated sawdust and vegetable creations on the road. The procession will walk over all this hard work, and that is the creators’ penitence! Of course I get it, I went to a Catholic school and remember the nuns talking about sacrifice and all that. Most religions have this self-effacing part, like the fasts Hindus keep to ‘purify’ themselves. It is about 3 in the afternoon and we are approaching a beautiful yellow and white filigreed church of the Merceds. We are struck by the intricate workmanship. There are some people hanging outside and I get a little distracted when a young gentleman approaches me speaking clear, unaccented English, ” Excuse me but are you from India? I love your country; I lived there for a few years!” I am delighted to meet him and his wife joins him to add, ” I studied in Calcutta in 1998!” We talk, laugh and I leave excited to meet someone like that in Antigua. Simba urges me to go in and look at something in the front. 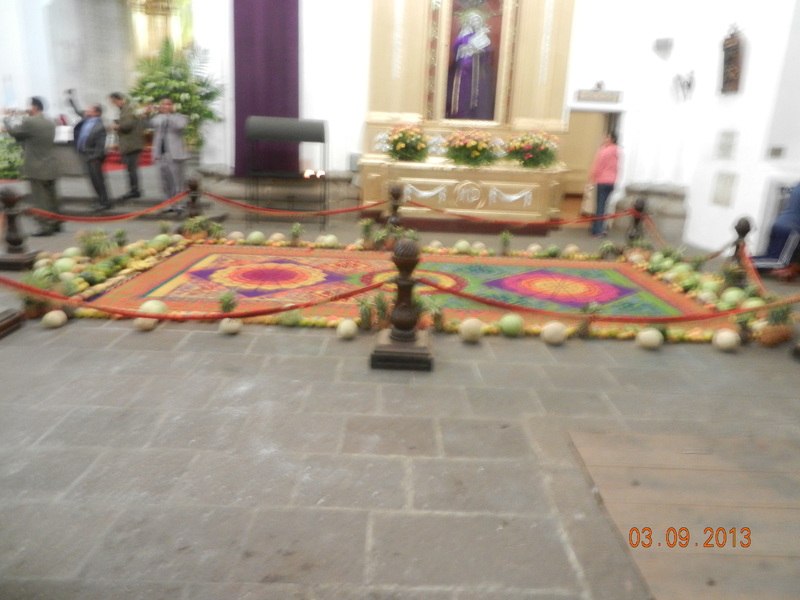 I enter the Merced church, I am continually amazed by the statues of Christ with stigmata; parishioners are attending a service and I quietly walk to the front to see this magnificent colored carpet of many colors and surrounded by vegetables of all kinds. ” Simba what a beautiful carpet !” I exclaim and he corrects me, ” No, it is not a carpet it is a design made with colored sawdust!” I think of kolam / rangoli in India and marvel at it by going back in again. By this time it is getting darker in the late afternoon and Simba decides to drop us off at our hotel, Casa Santo Domingo. Hedda and Jennie want us to be dropped off first because they say that they are dying to see this hotel of ours. 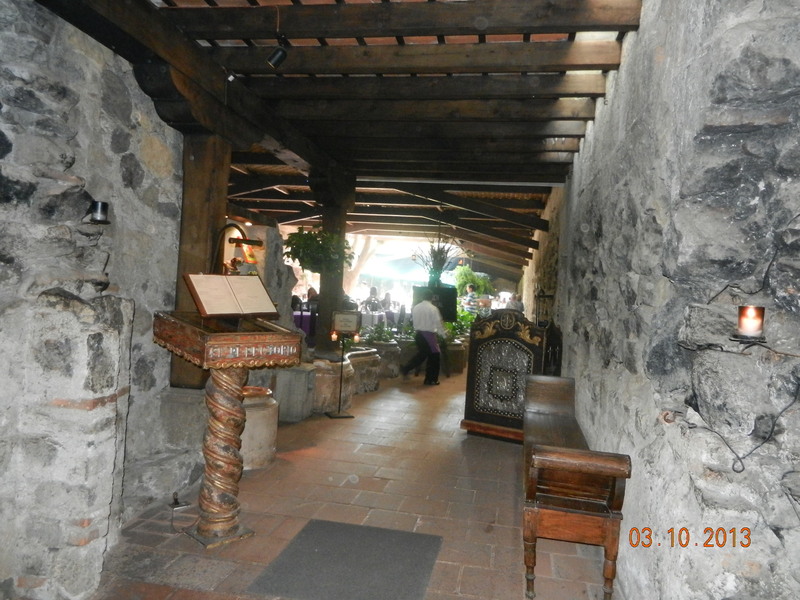 Well, the lobby is grand and has many statues and the passage area to the dining room looks wierd with holes in the stone walls. Apparently it was a Dominican Monks’ monastery. It looks grand and has a whole museum area that is closed by the time I discover it. The hotel room looks inviting and I feel like taking a nap before dinner. 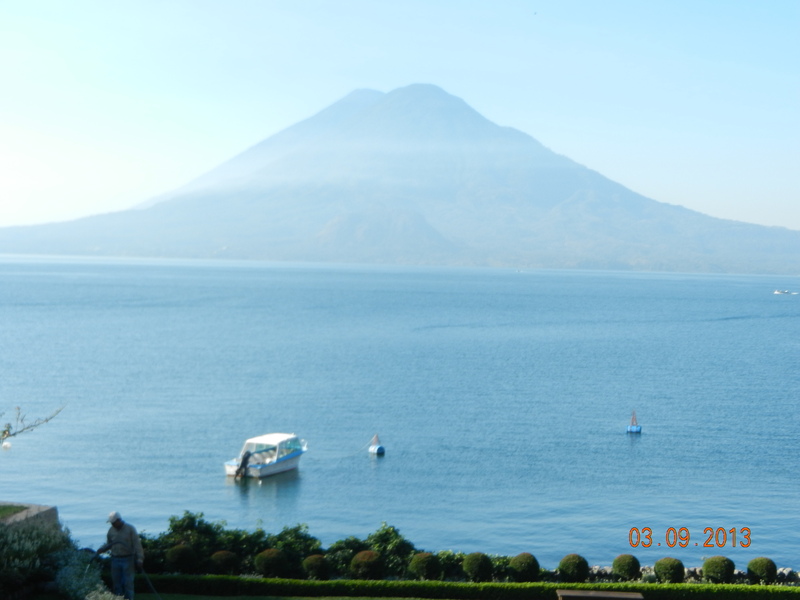 Guatemala diaries: Antigua we are there! 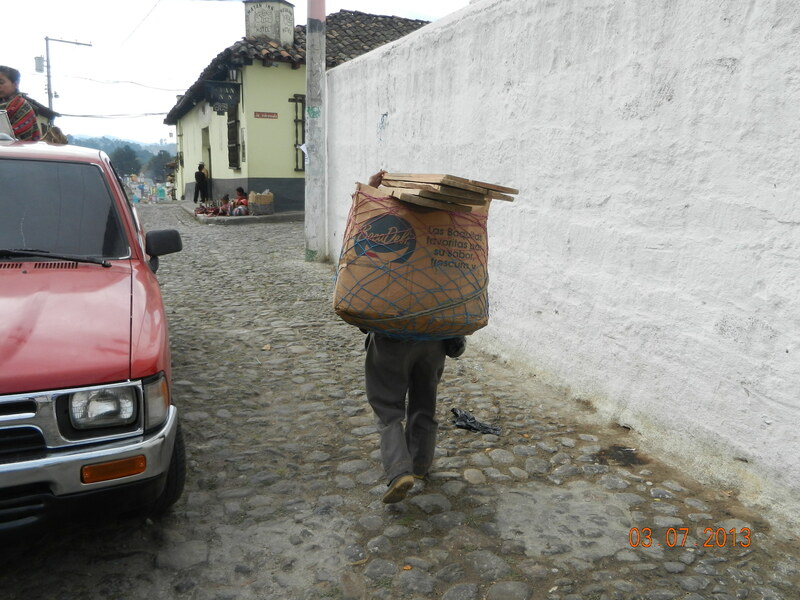 At Santiago de Atitlan , the streets are narrow and people’s residences are at the back. 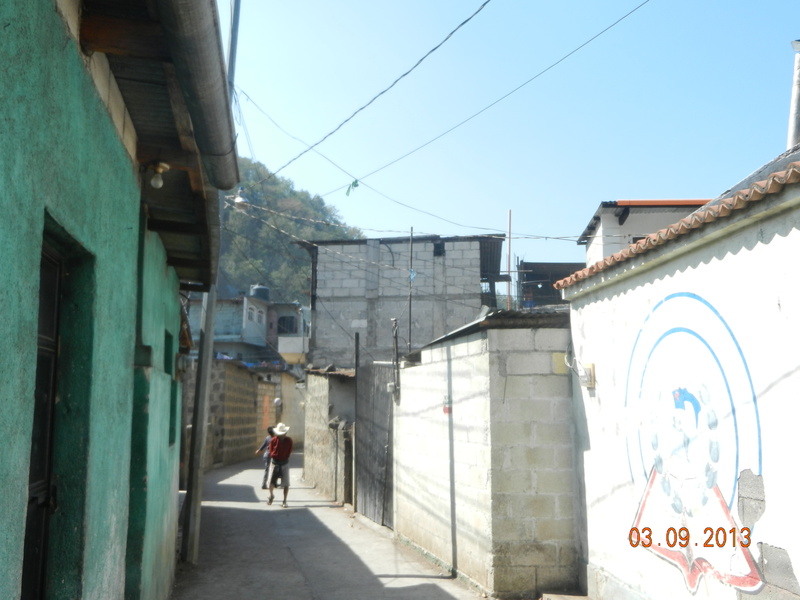 Squashes and flowers and dogs abound on the narrow passages to the back and the houses are very modest. As we walk the streets, I see young children playing football so I have to ask them who their hero is. They mention someone from Honduras. 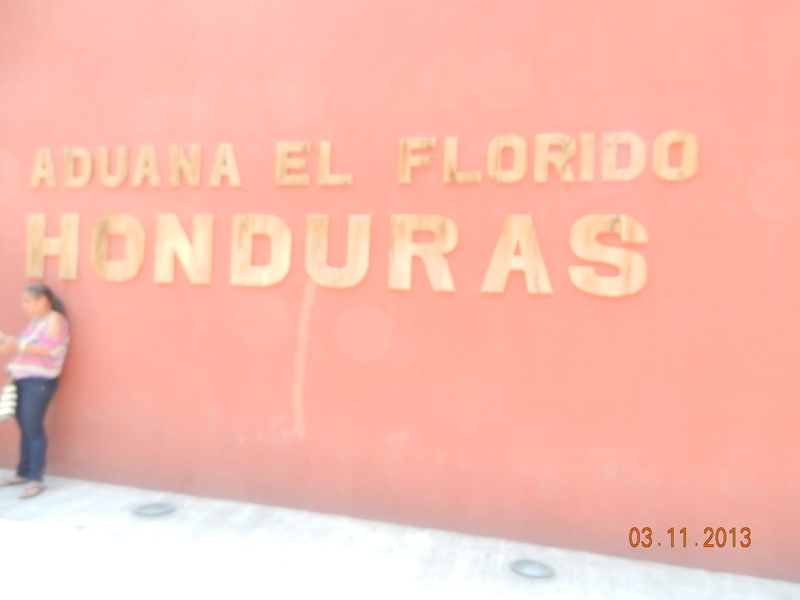 We had been told that in Honduras, football was not a sport, but a religion. Walking down the cobble-stoned streets we see more shops and lovely hats for the grand-kiddos. They look liked the bowler hats that Bolivian women wear. More hurried bargaining and purchases later, we sit in the boat to go back. 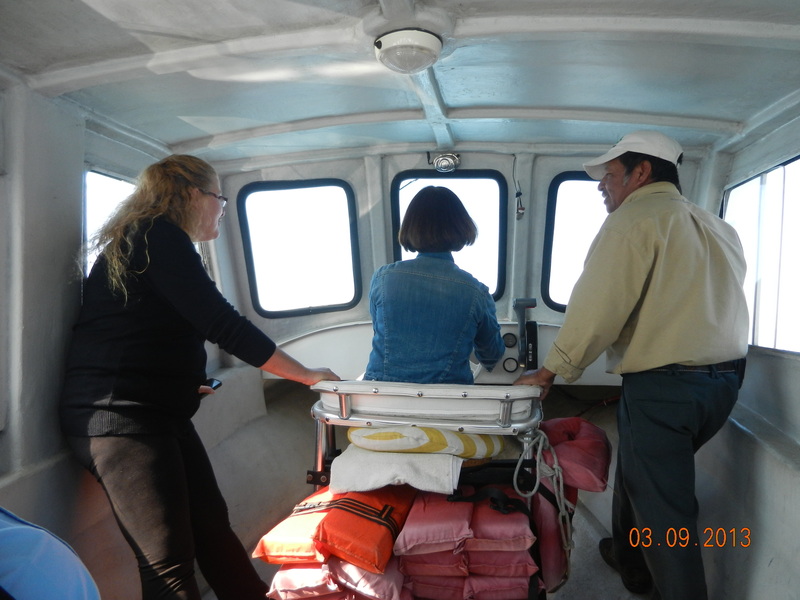 Half-way through Lake Atitlan, the boat stops. Oh No! The driver is joking about lack of petrol, what!! He is able to start the boat and we reach our old hotel in one piece. Too much drama for me…. Simba is loquacious as he drives us closer to Antigua, he talks about Chimaltenango, Quetzaltenango ( we did not go that far west) and as we reach Cocotenango we have to ask about the meaning of the ‘tenango’ piece that was added to all these places ( Chichicastenango as well) ” Ahaa! 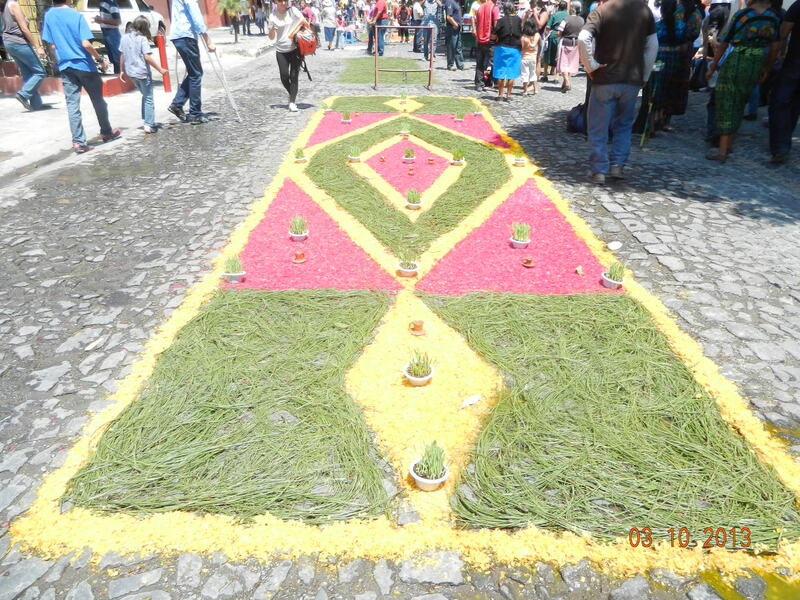 ” says Simba,” Tenango just means ‘the place of” in Mayan.” Of course! Think of ‘nagar’, or ‘pettai’ or ‘halli’ in India and ‘ville’ say in the USA. Makes sense. So then of course we learn that the ‘Chimal’ refers to trees so it’s the place with trees and Quetzaltenango is the place with quetzales, the beautiful bird of Guate that is getting endangered due to excessive hunting and then my favorite, Chichicastenango: supposed to be the place of stinging nettles. Don’t believe the last one, my sweet sweet Chichi did not have anything unpleasant for me! Well then I started thinking about names in general. Greenland is hardly green, a desolate patch of loneliness and ice for miles and Iceland is a gorgeous place with geysers and beautiful scenery even if it is cold. And then we have a place in Chicago called Downer’s Grove, seriously?? While Simba is chattering we get back on the Pan-American highway but the road keeps winding and I close my eyes and listen. How much more of this? I have a dread of big white lights in buses, cold chocolate milk, because as a child, feeling motion-sickness was always linked with those two things. So as I felt woozy, I had to think about them and feel worse. 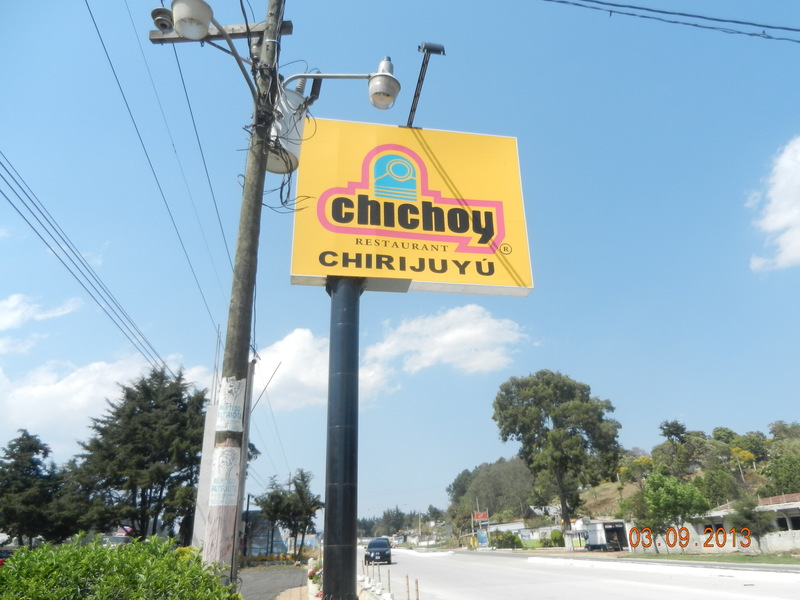 Soon we are on less tortuous terrain and stop at Chirijuyu near Chimaltenango, for lunch. And what do I eat there? More thick tortillas made fresh, an excellent bean soup and yes, chocolate milk! My stomach feels like cement ( those tortillas are small but thick) as we get closer to Antigua. The gift shop at the hotel is truly amazing( the prices are amazing too but we are assured that the quality is top notch) Of course the great shopper husband goes a little crazy buying for our grandsons and other family members. I have a good time chattering away with the saleswoman in Spanish. I notice that Spanish expressions like”Hijole” are not common in Guate, I have to curb my Mexican spanish here(and forget my chilango spanish too!) What excites me is the fact that people are forgiving when I make mistakes and are so gracious when I speak the language. We leave the gift shop and I meet the Spanish couple from the gardens; they are also touring the country from Barcelona. Paco and Juaquina are thrilled to continue talking in Spanish having great trouble articulating in English with the other tourists in their group. We go to our room that is charming and sit down to journal. There is one thing that is a bother though; we keep moving every morning to a different hotel and this particular one is so lovely with the gardens, I would have loved an extra day here. Next morning, our packed bags are put in the van and we are hustled to the dock area in the hotel garden. Slowly I get into the boat and we have others besides the four of us. There is Simba, another tour guide, Arty and his 6 tour group; Paco Pena ( he does look like the famous Spanish musician) and his wife are part of that group. Simba tells us that after Antigua, Arty will be our guide and he will depart. I will miss the gentle lion. Arty is a chatterbox; the moment he finds out that I speak Spanish, he keeps me busy talking. I enjoy the scenery and feel glad that I am not seasick. Well this is a lake, and I should be fine. What a beautiful place! We are surrounded by mountains and some of them are volcanoes. I breathe in the cool air and admire the blue water and greyish -blue mountains all around. Soon, Hedda decides to steer the boat and my husband is vowing that I do it when we are returning. You are crazy ! I am barely OK sitting in a boat and he expects me to steer it?? 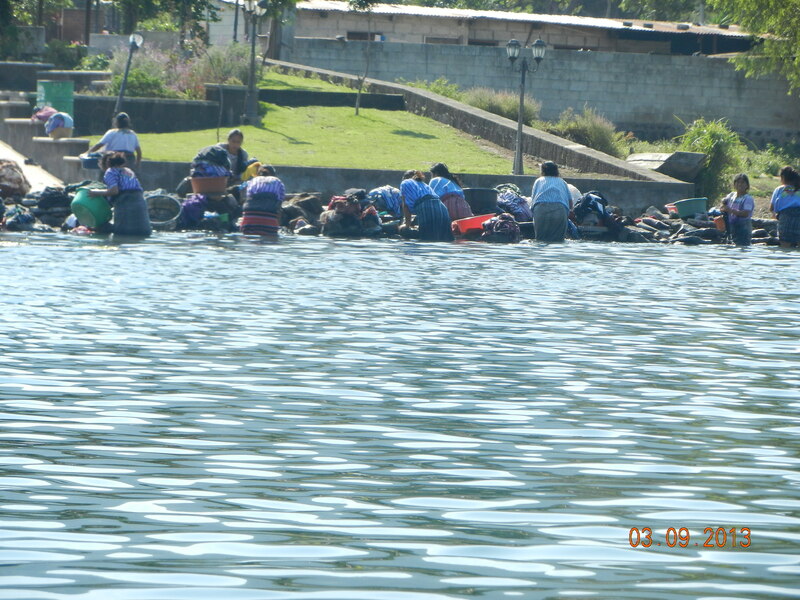 The boat ride is not too long and we see women washing clothes near the shoreline, white-billed ducks called pato de poc and get down at Santiago de Atitlan. Landed in Panachajel, close to Lake Atitlan. 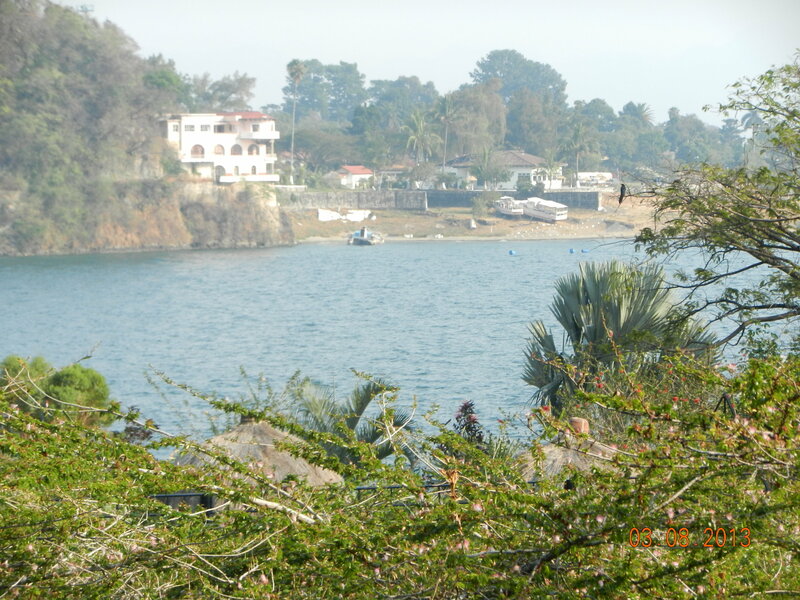 The lake area is a popular destination for tourists and all the different Mayan communities live close to and around this lake. Panachajel, where we are, is crowded with foreigners, especially white people and has some interesting store fronts. We get to the restaurant called Casablanca which has pictures of Bogart and Bergman but also a motley of photographs of Mayan women, abstract art and some pictures of Hindu gods and goddesses added for good measure. There is even a painting of Mother Teresa hung on the walls around us already crowded with different pictures. The food is delicious and we learn that the owner is from North America, what else?! We are close to Santander street and plan to come back in the evening for food at Bombay cafe( I have already checked out Lonely Planet for some restaurant suggestions) and some shopping. 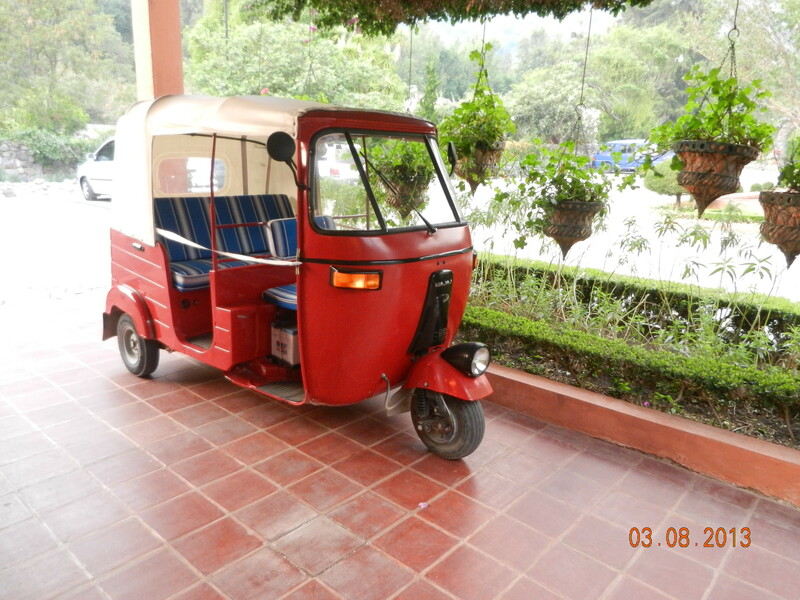 They have ‘tuk-tuks’ here; what we in India would call’autos’. 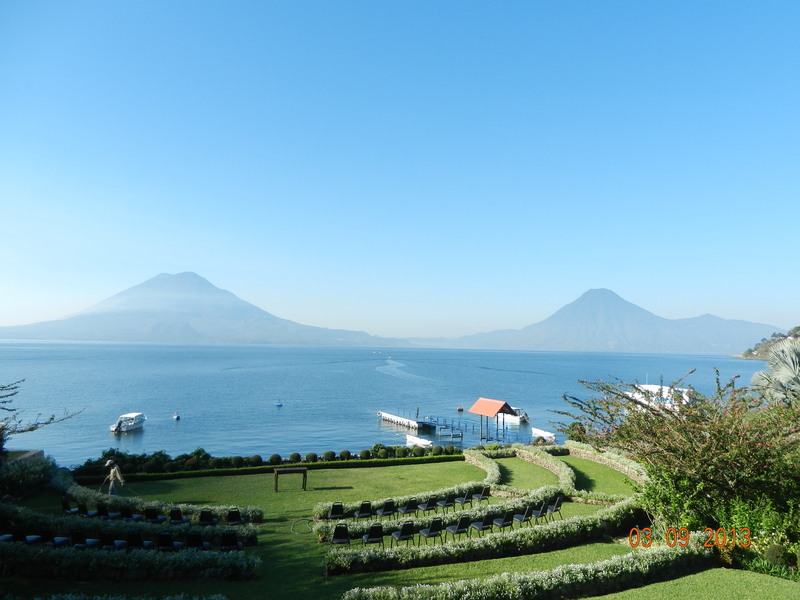 Simba takes us to our hotel through a bumpy, gravelly road to a beautiful hotel on the lake called Hotel Atitlan. The gardens are absolutely gorgeous and I see a couple in the garden who need someone to take their pictures. Simba leaves us to remind us to be ready in the morning for a boat ride on the lake. My husband is waiting to shop at the big gift store right there in the hotel and takes me in. Simba is a very interesting guide; he looks like a guero(white man) but is very connected to the Mayan people. He calls himself a ladino, which means half Mayan and half white. Apparently, his grandfather was an American, who came to Guatemala and had a Mayan mistress whom he abandoned and went back to USA. I think that must have made Simba bitter about his white ancestry and maybe makes him closer to the Mayan traditions. 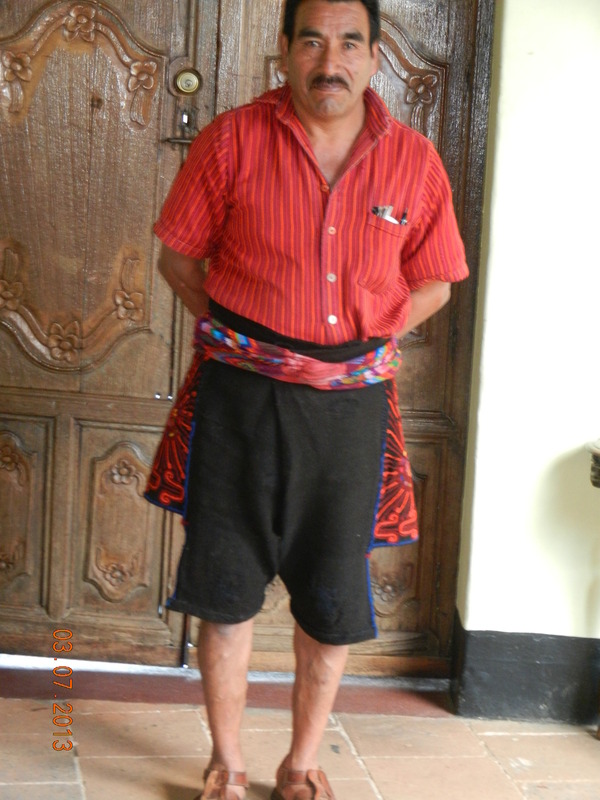 Whatever the reasons, he is fascinated with the curanderos ( loosely called witchdoctors in English, but it is more like alternative medicine) of Guatemala that I mentioned in my first two posts. having grown up in India, I am very familiar with this whole world of alternative cures and medicines. The sweet woman , Raji, who takes care of my sister’s house and dog in India follows these traditions. When her son has problems with mental health, she prefers going to somebody and ask for advice instead of going to a psychiatrist. So we follow Simba up the hill to see the colorful gravestones in the cemetery. 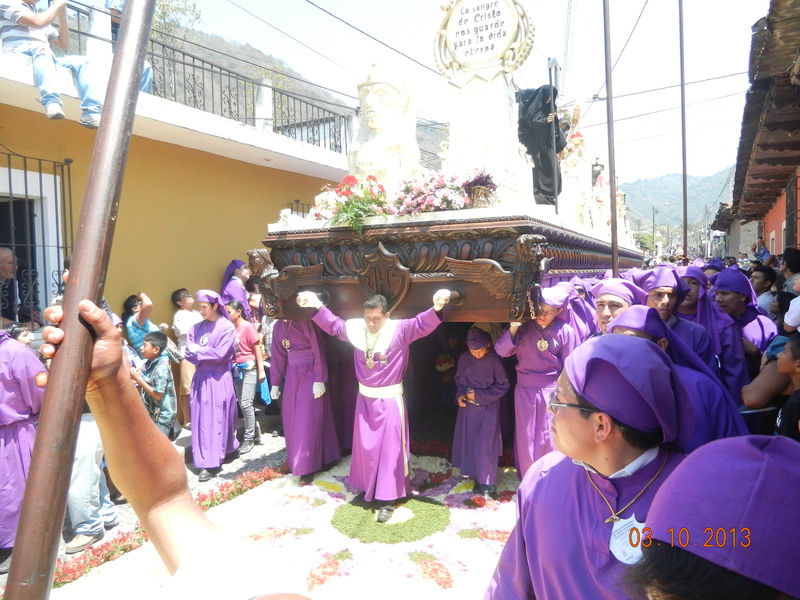 There is even a gravestone with the Virgin of Guadalupe ( the dark-skinned Mary of Mexico) There are smoke-covered dark areas where the Mayans have obviously used incense, candles and rum offerings to their gods, a prefect blend of local beliefs with the Catholic tradition. 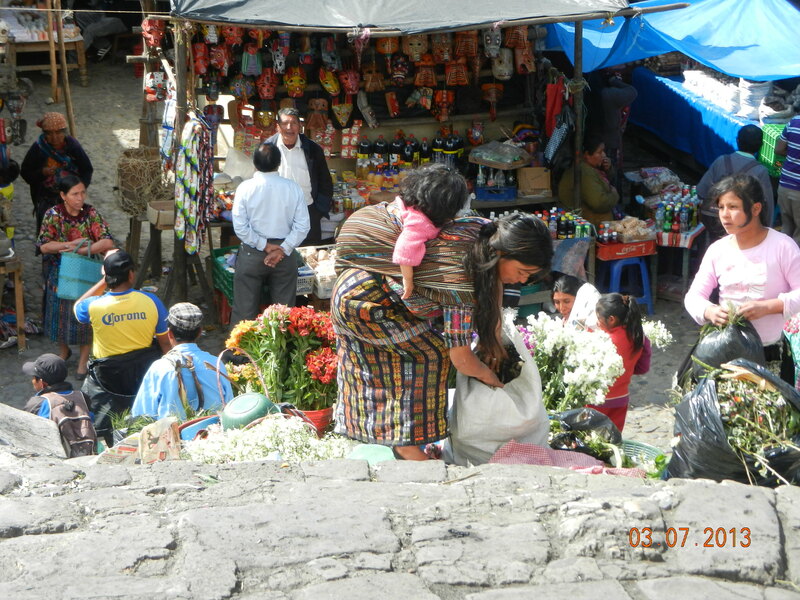 We leave Chichicastenango to go onwards to Lake Atitlan . 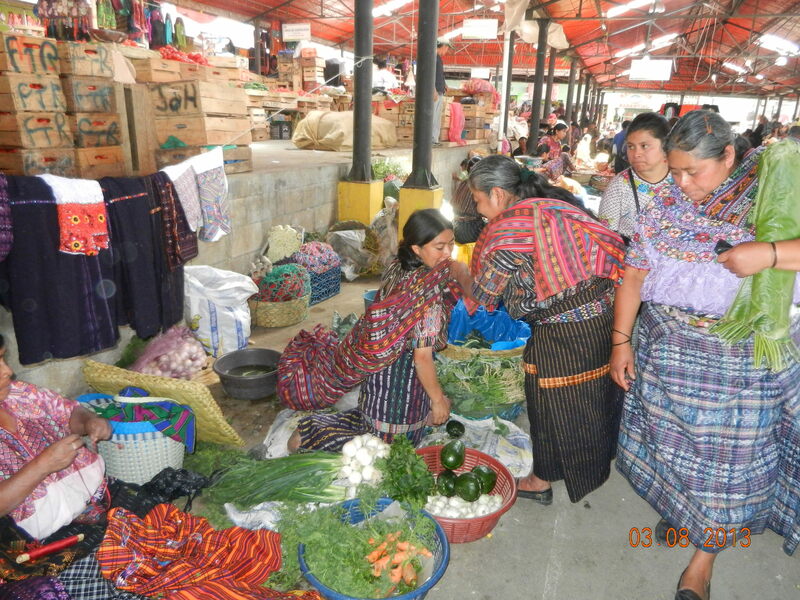 On the way, we stop at another colorful market at Solola to see dark- colored chayotes, vegetables, chillies and fish. 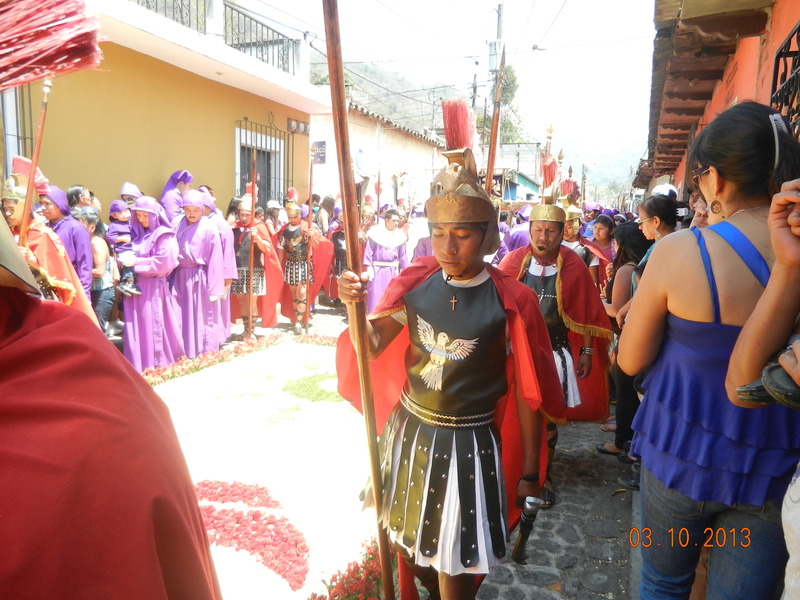 Here there is more colorful attire, more Mayan groups from different parts around the lake. Before dinner that evening( where we are the only two served by our waiter,Juan, dressed in 16th century style attire) we go to the bar area to talk to the gentleman at the bar. He is a small man with glasses and speaks English and Spanish, but tells me that he is Mayan and speaks Quiche. His mayan name is Loo with an accent on the ‘oo’ sound that abruptly ends, kind of hard for me to say! 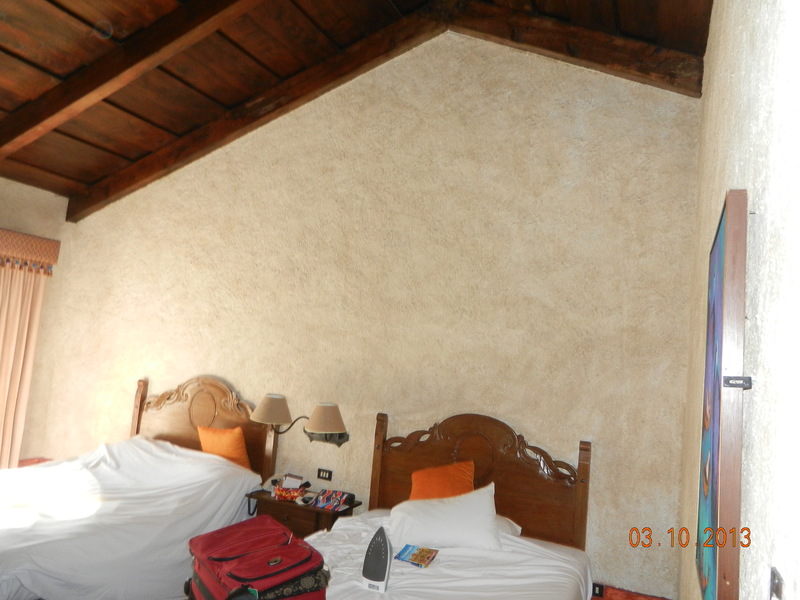 What a charming room and adjoining rooms! We discover an ancient typewriter in one of the rooms and paintings by early 19th century Guatemalan artists called Garabito andAlfredo Suarez. We discover a computer as well in that room and quickly check messages. Loo is very friendly and talks about the German American who started this Inn. (There is a faded black and white picture of the gentelman, early 50’s rendition. Most hotels in Guatemala seem to be owned by Americans who must have come here early on in the 20th century) He mentions that tourism is low right now( pretty obvious since we seem to be the only people around)I ask him about buying stuff at the market and he states that it is a good place to bargain and buy beautiful hand embroidered ‘huipiles’, the blouse the women wear. I regret in my mind the fact that I missed a chance that evening buying one of those by bargaining too hard, feel like a tightwad not having bought something from that woman. Juan comes and puts firewood and lights the fireplace. We go to bed with several layers shivering and I, for once, wear my shawl tightly wrapped around in the morning to have a look at the beautiful birds chirping while my husband grumbles about the cold, cold night. Before Simba arrives, we have breakfast and walk up and down the undulating, cobblestoned streets as the vendors come in and out cleaning up after the Sunday market. It is Sunday morning and we get ready to meet our new guide at 7. Simba( I have to call him that,with his blond mane and big body, he reminds me of a mighty lion) greets us at the front and we get into the van. He is both our driver and guide. Simba stops at a hotel in Zona viva to pick up two women who would be with us for half the trip. Simba talks all the way. 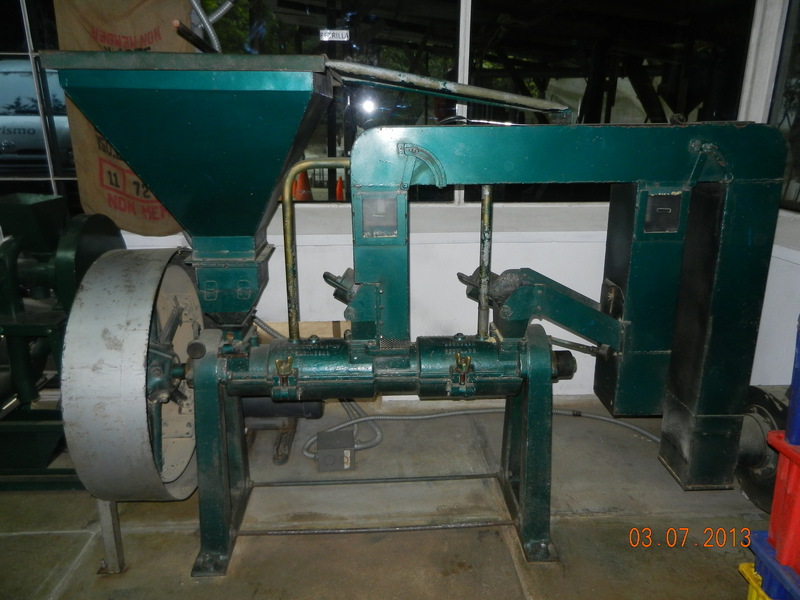 We first stopped at a coffee processing plant and talk to a lady who explains the process and let us try the coffee there which is delicious. Then we get on the road again, winding roads; it feels like I am in the hills in India and also makes me feel a little sick. When I do sneak a peak outside,the view is breathtaking and Simba points out some volcanoes as well in the distance. Many hair-pin bends later we stop to eat lunch. 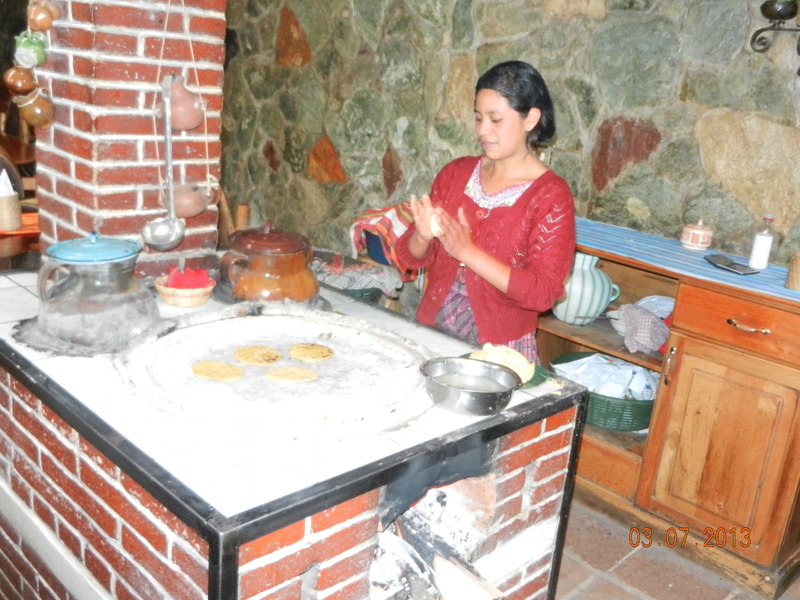 I see a woman making tortillas; she takes a lime size dough from her pan of ‘masa’ and just pats it in her palms and she puts( a slightly thicker version than the corn tortillas I have seen in the supermarkets in Chicago)the tortilla on a hot concave base and cooks it. We try and our efforts are pitiful; they either tear up or are tinier versions of hers. She must think we are inept cooks! Lunch is good and filling: lots of warm thick tortillas with beans and cheese and a cup of hot chocolate to wash it all down. Back on the bus with my eyes mostly closed with more twists and turns as we go up mountains. We see lots and lots of women wearing colored skirts and beautifully embroidered blouses. 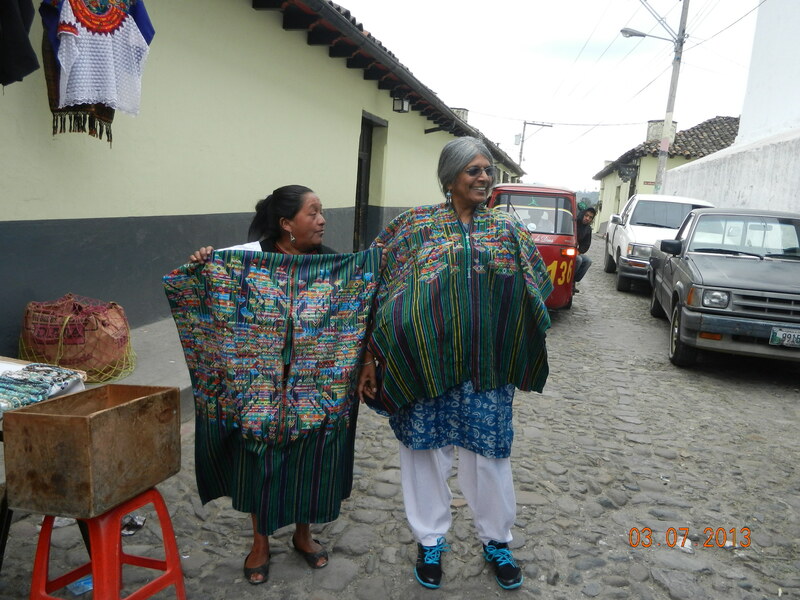 Simba tells us that based on the style of their skirts and blouses one can tell which group of Mayans they belong to since there are over 20 different Mayan languages and groups in and around Lake Atitlan and surrounding areas. 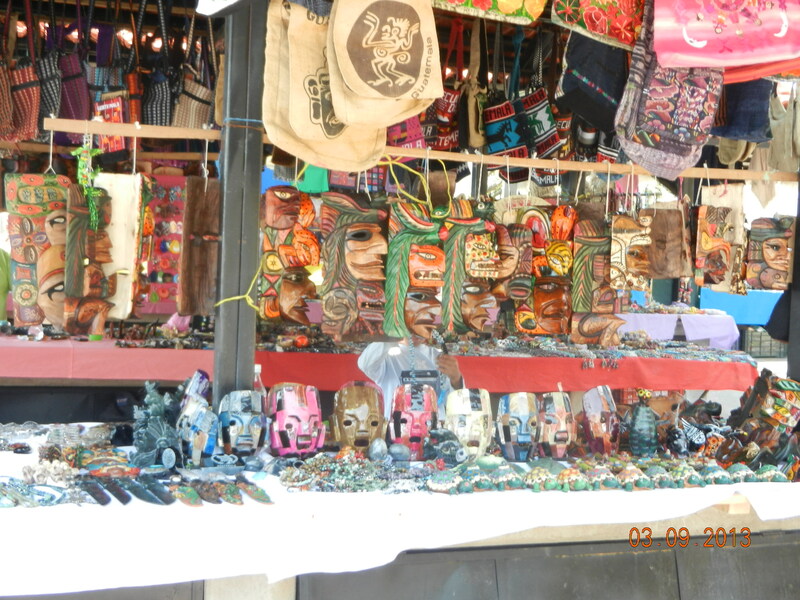 We finally arrive at Chichicastenango to the Sunday market where many Mayan families would be selling their wares in between the two churches, El Calvario and Santo Domingo. On the way we stop at some trees growing along the sides of the road and pick up orange-colored beans. Simba drops the two women at their hotel. It is a charming place with cockatoos, macaws and beautiful trailing vines and plants everywhere. Our hotel Mayan Inn is smaller but similar. 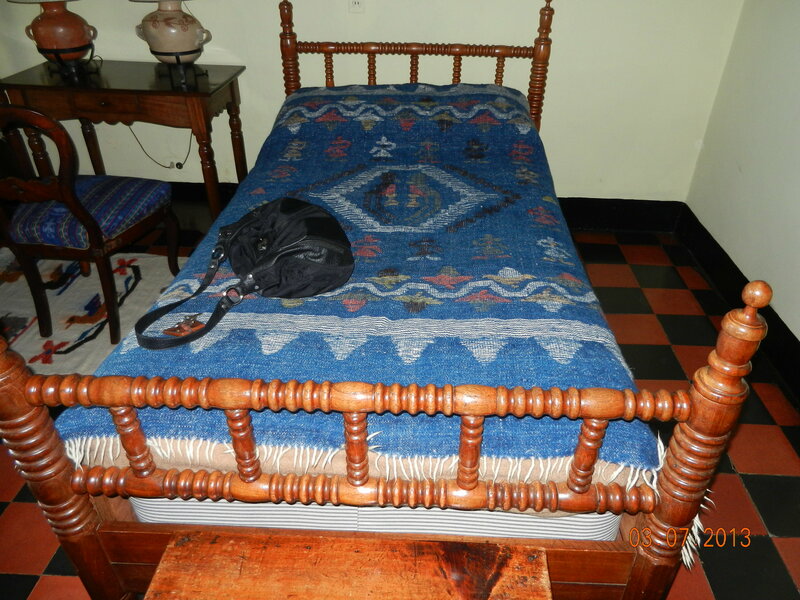 Our room is tiled, has a fireplace with rugs and two beds. It is chilly already and I know we will cover ourselves with layers of blankets and need the fireplace started. I realized that my posts are not chronological. So let me start from the beginning. As I mentioned earlier, we had sufficient warning as we picked up our bags from a young woman who lives half the time in Guatemala and the other half in Miami. As we walked out and I was successful in warding off anyone who spoke to me in English by responding in Spanish, we saw our driver ( carrying our name and tour company). Marcelo chattered all the way and I noticed some big buildings. 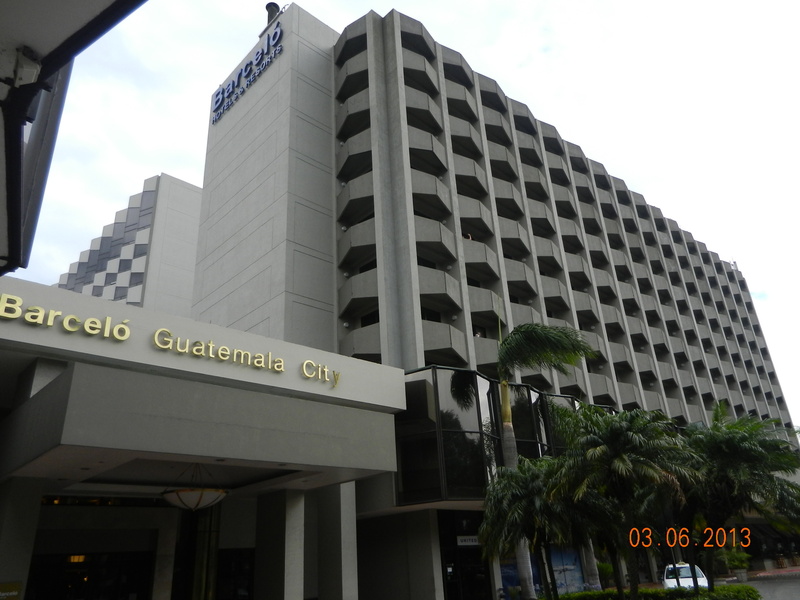 We were staying at Barcelo (Westin chain) close to Zona viva ( Zone 10) the safer zone. 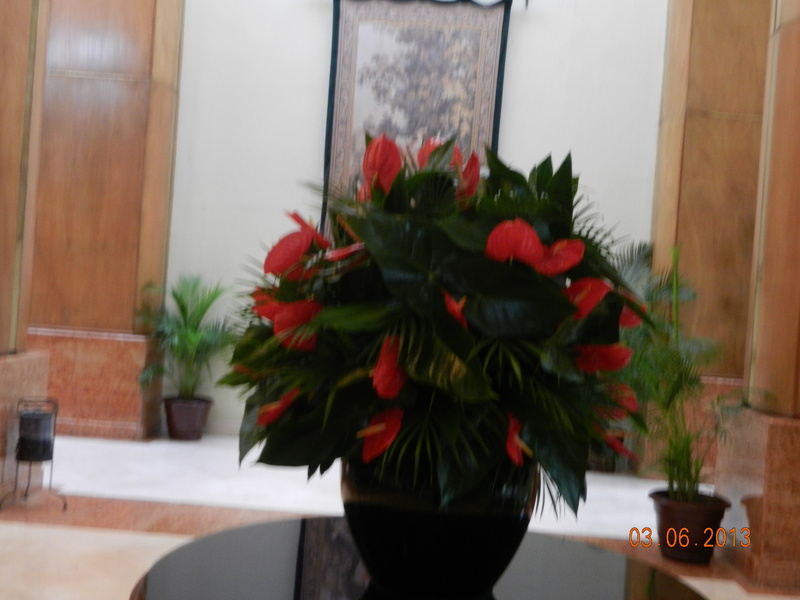 The hotel was beautiful and the young man attending to incoming cars assured us we could walk around till 6pm. We stepped outside gingerly and saw ( what else) a Macdonald’s. Reassured by a fast food chain close by we walked towards Zone 10 where most of the tourist crowd was housed in several hotels we could see. 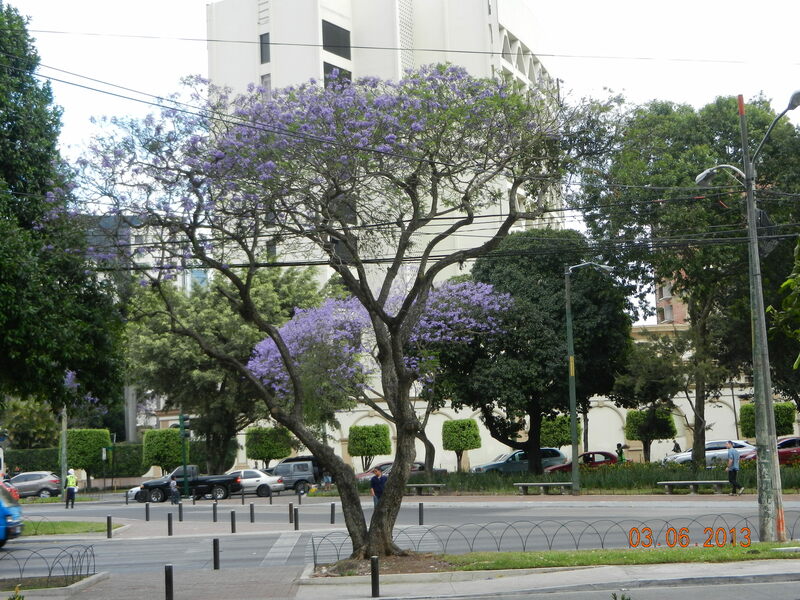 The crossroads near the hotel was pretty with a big jacaranda tree in bloom. Lots of little shops lined the sides of the street and we peeped in to look at the wonderful brightly colored textiles. We quickly returned to our hotel. 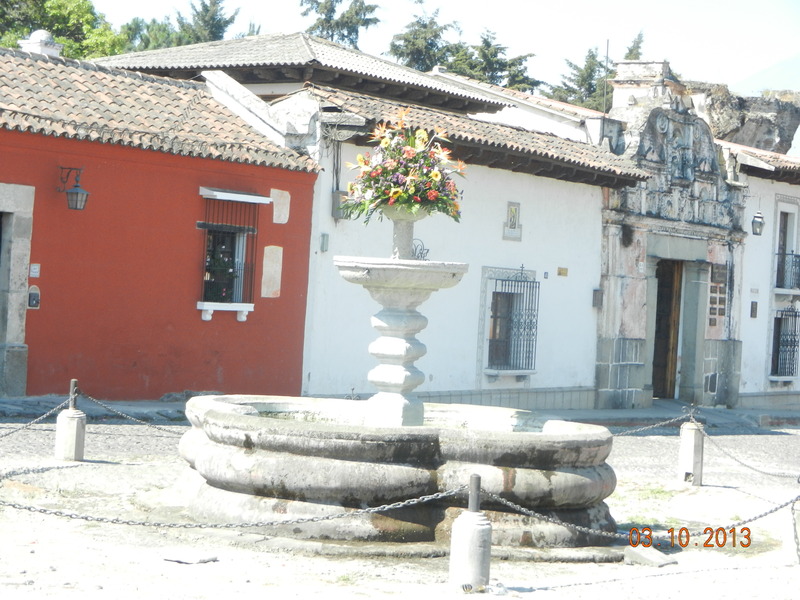 That was our first glimpse of the capital.We were leaving early morning for Chichicastenango, for the Sunday market and we would probably see more exciting handicrafts there. You are currently browsing the Chobhi's Blog blog archives for March, 2013.